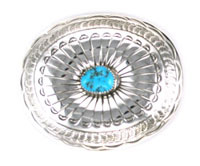 Sterling silver large oval concho buckle with one turquoise stone in the center. Measures approximately 2 7/8" x 2 1/2", Navajo made by Carson Blackgoat. Stamping may vary. Stone will vary in shape, size and color shade. Not always available in sleeping beauty.